Here you can play online some original boardgames with other users. This site is completely free: no subscription is required. All features are available to all players. All of our games are browser-based: you just need to sign up for the fun to start: there's no need to download any program. Unlike many other gaming sites, the required commitment is very low. All of our games are turn-based: you can connect whenever you have the time to, and make your move. On the other hand, if you really love our games, you can join an unlimited number of different games. There are 11 active games on this website at the moment. Registered users can create new games or subscribe to pending online games. If you wish, you'll be informed about when a game starts and when it's your turn to play via mail or through a personalised RSS feed. 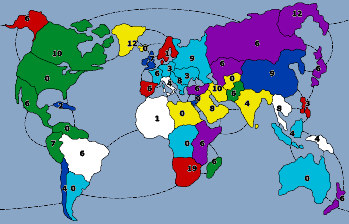 Our games use a simultaneous actions selection system: each player submits his/her orders secretly, and when all players have chosen their moves the turn is solved. This allows for faster gameplay, and some psychology is needed to guess your enemies' choices. 2010, June 17. Try ticking "remember me" in the login form: now you will be logged in automatically the next time you come back. 2010, May 20. Two new VP prebuilt fighters: the ComCon Lightning and Mercenary Assassin. 2009, August 16. Art of War: improved kill odds calculator, courtesy Calsir and BlckKnght. 2009, April 22. VP: fighters that retire from the game field now lose points. The points lost are one half those lost in the case of a kill. 2009, March 22. Two new VP prebuilt fighters: the ComCon Nova and Imperian Gladius. 2009, March 19. AoW map tweaked! Two borders have been removed from the Europe map. More info in the forum. 2009, March 19. VP scenarios! More info in the forum. 2009, March 6. VP chits colours. Experimenting a new rule in VP experimental games: no chit colours, and no critical hits on engines. More info in the forum. 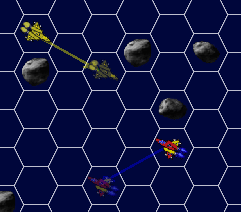 Void Patrol is a game of dogfights between space fighters, played on a hex map with simultaneous moves. The battles take place in asteroid fields (you have several different fields to choose from). The game features original movement rules, and a simple and user-friendly interface. We have four game levels: simple, standard, advanced, and experimental. The simple rules allow you to get started at once: they're simple but challenging at the same time. Standard rules introduce new weapons: inertial grenades, cluster rockets, berserk missiles, and special dual thrusters. Advanced rules introduce a whole new concept: fighter design. You can create your own fighter, choosing between tens of different items, such as many different types of engines, thrusters, shields, weapons, and so on. Experimental rules are where most of the playtesting takes place: from time to time we introduce and playtest new pieces of equipment, new features and game rules. 3216 Void Patrol games have already been played on our website! The Art of War is a risk-like game with simultaneous moves. The game has very simple rules, but at the same time it has rich tactical and strategical dynamics. You can choose between several different game options, allowing or disallowing private messages, choosing between different maps, whether new reinforcements are deployed automatically or freely by each user, and so on. 3801 the Art of War games have already been played on our website! The game rules are here. If you have any questions, be bold and contact us at webmaster@takeaplay.net. 2008, December 7. AdBlock fix. Fixed an incompatibility issue with some adblockers, that would filter some of our navigation images. More info in the forum. 2008, November 11. Chatbox. Completely rewritten the chatbox code from scratch. More info in the forum. 2008, April 13. Space Wing: Void Patrol. New! Now you will get a warning when your trajectory makes you collide on asteroids! In addition, still another version of the fighter sheet, with the available movement chits displayed. 2008, April 4. Forum. Now you can switch between a history view and a thread view. In addition, now you can use preformatted text for code, tables, or ascii art. 2008, April 3. Chatbox. The old messages in the chatbox are now no longer deleted. Minor improvements in the stylesheet (form fields). 2008, March 20. AoW supply lines. A simplification in the interface. Now, in automatic placement games, protected territories issue by default the same transfer order as the previous turn. 2008, March 19. New VP fighters. Introducing the Spitfire, Dragon, Spark, Swallow and Swallowhawk, as well as revamped versions of the First and Arrowhead fighters! Fighter description/histories &emdash; now, when you join a VP game, you can see at the bottom of the page a short description and the full of history of each prebuilt fighter model. Firefox users: now you should see rounded corners (almost) everywhere. 2008, March 17. VP characters. Cleaned up a few bugs in the VP characters history page. 2008, March 14. VP map & radar. VP maps and radars have been reduced a bit, to fit exactly what is needed in each game. 2008, March 7. DataBase optimisation. Database usage has been reduced from an average of 24KiB per game to an average of 15KiB per game. The new game. A small update on the development of the new game. The code is being re-written with a rather heavy use of AJAJ techniques, which are required for the game's characteristics, in which a constant interaction with the server is necessary. This has allowed to bypass a programming bottleneck. The road to the publication of the simplified version is now downhill. 2008, January 4. Void Patrol fighter charts and fighter creation engine can now be browsed also when not joining a game! Just follow the link to "fighter charts" (when logged in). More info here. The full site history is here. This page has been visited 641112 times, and there have been 172944 logins since spring 2005!